The long awaited restriction on FOBTs or fixed odds betting terminals has finally arrived. Earlier this week, Matt Hancock, the culture secretary, announced the maximum stake for FOBT machines would be reduced to just £2 from £100. This is a move many in the betting industry were expecting for a long while, however, few knew of its severity. Many thought Matt Hancock, who was recently appointed culture secretary in Theresa May’s cabinet reshuffle, would shy away from coming down too heavily on the bookies due to his ties with the betting industry. However, it appears nothing got in his way of delivering a new era of betting. This restriction will have huge and diverse impacts on the betting industry. Some bookies will be drawing up plans (if they haven’t already) to challenge this decision through a judicial review whilst others will be planning how to cope with the new stake limit. A judicial review is a last resort option which may not be triggered at all. How this affects the bookies? It’s fair to say, the bookies know the time of £100 maximum stakes has gone. The modern gambling industry is considerably different to how it was ten years ago. Bookies have done incredibly well from betting machines and they must thank the Labour Government of 2005 and move in tune with today’s world of responsible gambling. There are undoubtedly going to be a vast number of shop closures along the high-street due to a huge drop in revenue. Each FOBT pulled in more than £1000 a week. With each betting shop allowed up to four machines, this was a brilliant revenue stream. For some stores, this provided most of their revenue. With the maximum stake now cut to just £2, these stores are likely to take a hit. Unfortunately this means job losses and empty buildings along the high-street, adding to the ever worsening retail industry. Obviously, this restriction hinders some bookies more than others. Those with a greater high-street presence will feel the sting more than those with less retail shops. Companies such as Paddy Power Betfair, with a comparatively smaller number of shops, will be less affected when compared to the likes of William Hill and Ladbrokes Coral. This is great news for problem gamblers. You only comprehend the extent of this gambling issue when you see it first hand. I’ve personally been in betting shops and seen gamblers wander in with fresh wads of £20s from the payday loan shop next door or the cash machine across the road and stake all their money in a matter of minutes. The machine just continues to devour in the notes, whilst the gambler stares at the machine more nervously as the wad of cash in their hand gets ever smaller. It’s horrible to watch and the worst bit is the gambler usually heads back to the cash machine or loan shop and repeats it all again. Thankfully, this problem won’t be anywhere near as serious with the new restriction. There’s only a certain amount of £2 coins you can carry! Arguably, some gamblers are that addicted they will actually be annoyed at the stake being reduced. They’d be more annoyed that their potential winnings are now considerably reduced. This just shows the mentality some gamblers find themselves in. There’s a huge difference between betting and gambling. Whilst the dictionary definitions are pretty much one and the same, there’s a disparity in meaning. With betting the punter has at least some knowledge on the likely outcome of an event, where as with gambling there is no basis to predict the outcome of an event. Betting in my view is a sane way of having a bit of fun by predicting the outcome of an event. Gambling is wagering money on fixed odds betting terminals where the outcome is completely unknown. Hopefully for the betting industry, this is a turning point. Over the past decade or so and since the Labour Government of 2005 allowed high-stakes, high-speed gambling, the industry has been too concerned about gambling over betting. It’s no wonder when it’s such a powerful revenue stream. With sports betting, there are far less problem gamblers which ultimately makes for a better industry for both the bookies and the punter alike. Granted, there are going to be some store closures in the wake of this decision simply because there aren’t enough people betting in-store anymore. The UK gambling sector needs to take a leaf out of the flourishing Irish high-street industry. Their high-street bookies are doing remarkably well and hardly any of them have FOBT machines. Maybe this is what the future of British bookmaking will look like. Having said that, competing with such a giant as the Internet is a tricky feat. With the digital gambling sector doing so well, it may be too late to revive the high-street betting sector in Britain. For the traditional punters sake, let’s hope not. No, matched betting will not be affected at all, and it may even benefit in the longer run. Let me explain why. Gambling on fixed odds machines has absolutely nothing to do with matched betting. We’re interested in what free bets and bonuses the bookies have to offer which ties in to their sports betting sector, not the gambling sector. The more offers we can take advantage of, the more money we can make, it’s as simple as that. Now, in the long run, the bookies (certainly retail dominated bookies) will need to depend more on online betting. They’re not going to sit back and let the lack of FOBTs revenue hit them. To gain new customers each bookie uses incentives in the form of promotions and bonuses. These are what matched bettors take advantage of on a daily basis. 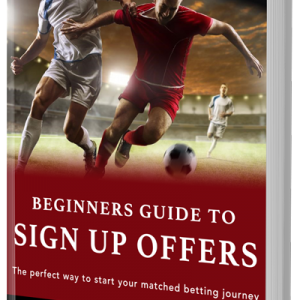 Matched betting is the number one way to make money online in 2018 and it’s incredibly popular with students and those looking to make a little extra income. Why not join in the fun today?